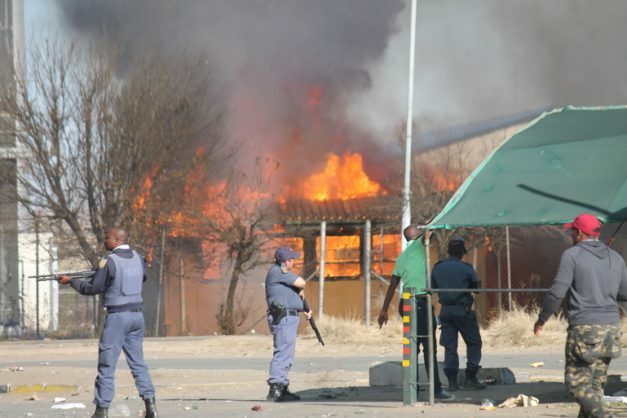 Police fire rubber bullets to disperse protesters who burned the eMbalenhle Post Office. Many shops have also been looted. Protesters want the president to swoop in as he did during the protest crisis in North West. Residents of eMbalenhle, in the Govan Mbeki municipality of Mpumalanga, vowed to keep on protesting until President Cyril Ramaphosa himself come down to community level and listen to their plight, reports the Ridge Times. Those leading the protest told Ridge Times that they were done dealing with their local councillors. The community initially held discussions with the nine ANC councillors who had decided to refrain from any council work until service delivery issues were addressed. These councillors helped the community to draft their complaints to the Mpumalanga department of cooperative governance and traditional affairs (Cogta) on 11 June. The community’s frustrations with recurring power outages and poor service delivery escalated as they awaited Cogta’s response, but to no avail. They have therefore now taken matters into their own hands and decided to distance themselves from any councillor. They feel they have tried to follow the right procedure, but have been disregarded and claim that Cogta is ignoring them. Mr Sifiso Zulu, a community leader, said he and other community leaders were now operating solely on the people’s mandate. “People said we are not quitting until we get the top leaders of the country here. The people are especially angry about the damages that they suffer every time there is a power outage. The community stated in their memorandum that they wanted the acting municipal manager of Govan Mbeki muncipality, Mr Tisha Mhlanga, removed. The township has been under siege by angry residents since late Sunday afternoon, with no vehicles or people moving in or out. All the main roads towards eMbalenhle have been barricaded with stones and burning tyres, and some protestors even erected a shack in the middle of the entrance road near Welamlambo section. Several non-protestors were dragged from their homes on Monday morning and forced to participate in the strike action. Many foreign shopkeepers packed up shop early on Sunday out of fear of being attacked. The police arrested 34 people for public unrest and another for looting during the morning. Looters tore into an ATM and looted the shop and office of EM Motors and the Lewis Furniture storeroom, where they stole every possible office appliance, including wall sockets, as well as furniture. Mr Hassan Mohamed of EM Motors said he was lucky to be alive as the mob was very aggressive and arrogant. Rioting mobs were peppering the police with stones while the cops retaliated with rubber bullets and tear gas. ER24 was escorted under police protection to help two injured police officers in the morning. The confrontation between the police and protesters boiled over into a mini war when thousands of people marched to the police station by midday to demand the release of those who had been arrested earlier. The arrested protesters face public violence charges, along with theft and looting of shops. The crowd split up into various groups, with one snaking through the streets to the post office where they torched the building. They then tried to storm the Mall@eMba, and some shops were allegedly looted. The situation was extremely tense at the time of going to press on Monday afternoon. Const Busi Mthethwa, the police spokesman, said the situation was very tense and urged motorists not to take chances. She said the police would continue to monitor the situation.